. flourless apple cinnamon muffins . - . running with spoons . « . link love 10/5 . I’d say baking is always a fun thing to do when you’re up at odd hours of the morning/night. These muffins look FABULOUS! Hope you’re able to get more rest tonight though. 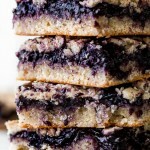 Favorite baked good = Blondies! I agree! I made a crustless pumpkin pie at 5:30 a.m. when I couldn’t sleep the other day. And it was my birthday too, how lame is that? On 4 hours sleep, I can’t believe that you are writing and functioning as good as you are Amanda! When I’m that out of wrack, well, that’s when I start finding diapers in the fridge. oops! Haha! I bake (or clean) whenever I wake up extremely early too! It’s TOO HARD to choose a baked good. I truly love them all equally… don’t make me choose! Fine. A good, not-too-sweet muffin + coffee. I love recipes where I already have all the ingredients!! These look fabulous, and as usual, I could go for one right about now for breakfast! Also, I used to have…I think they call it sleep maintenance insomnia, where I would wake up in the middle of the night every night. When life gets stressful, it comes back, and it is the worst, so I understand your pain. Hope you get some rest! It is rare for me NOT to be awake by 3:15 so I hear ya’. I’ve actually come to enjoy this time of the morning before the day really gets started. I actually made flour less muffins yesterday. I looked at a few recipes but didn’t have all the necessary ingredients so I just went with what I had on hand. Must say, YUM! These may be the best muffins I’ve ever eaten. Your apple cinnamon variety with bonus almond butter sounds like my kind of treat. 😆 But how can it be jet lag when my time zone didn’t change? These look really good and easy. They really look like they popped easily outside of the tin. Your recipes always look so simple but at the Same time easy. Derp…autocorrect. The easy should say good. There are a ton of recipes I see in the blogging world I think look good but too complicated for me. LOL @ losing your train of thought in #3. That happens to me all the time when I’m writing and usually results in ADD-like posts. Also, flourless muffins > cookies any day cuz you can pretend you’re having a brownie/blondie for breakfast without feeling guilty. My dear friend, this may of just taken the first place spot in my favorite recipes of yours! Holy smokes they look and sound friggen awesome!! Hahah you are hilarious….and a bit nuts but I love it :-)! Muffins just about get my vote as favorite baked good, even better with this kind of flavor combination…you know I’m sucker for all things apple cinnamon! I love that this recipe calls for only pantry staples- definitely all the more reason to whip up a batch soon! Can I come over for breakfast please?? YUM!! You should’ve called me since I am two hours ahead while you were baking the muffins. I like that I can make these right now since I have all of the ingredients. I love baking cookies but appreciate brownies and blondies because they don’t take much effort once they are in the oven. 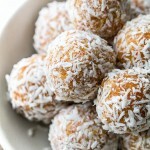 These look delicious and I think I have everything to make them on hand right now! Yummm! I’m going to call you the fluffy flourless muffin queen. When I can’t sleep…. that actually hardly ever happens so I have no idea what I do ahhah. LOLOLOL. Fluffy flourless Queen. Love it. FFQ. I havent tried many flourless recipes, but the one I did, I loved! It was a flourless chocolate cake 🙂 I always take melatonin if I can’t sleep and I try to do deep breathing. Seriously though, these are great pictures and this is a great recipe Amanda. I always look forward to your blog updates. Easiest recipe ever! 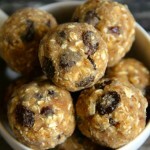 I’m trying to think of a healthy treat to make for Thanksgiving weekend – these might be it! Everyone usually makes/brings the typical things so I’d like to contribute something different! I don’t know if you saw on Instagram but I’ve tried your pumpkin breakfast bake and your pumpkin chocolate chip cookies over the last couple of weeks – both a hit! I’m a muffin girl all the way. Cookies come in at a close second but they need to be warm and fresh! You and I arr a lot alike I think. The major difference is in working out at 5am and usually sneaking a peak at blogs in between weight sets. I usually bake in the mid morning but have had those moments were in the morning I want to whip something up. There’s just something enchanting about muffins. They’re easy, good and make you feel warm and homey inside. Thanks for sharing that, Paula! I’ve actually found that, given the opportunity, I’ll wake up around 4 or 5, stay up for a couple of hours, and then go back to sleep around 7 or 8. It’s especially nice in the winter when the sun doesn’t rise until around 9 AM. i could take a whole batch right now..you have captured all the fall flavor into one delicious muffins. i could take a whole batch right now..you have captured all the fall flavor into one delicious muffin. I couldn’t sleep at all last night! I tossed and turned, then said I would just wait until it was appropriate to go to the gym. Then I finally fell asleep, so the gym didn’t happen haha. 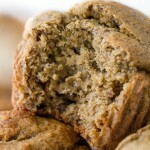 Apple cinnamon muffins would go perfectly with the coffee I’m currently sipping! Muffins seem to always find a way into my house…as for sleeping, that’s another story. I rarely ever have a night where I am not tossing and turning. I am not really sure why? you’re a baking culinary genius. and I also loved that you apologized for saying the M word. Wow! At least you were super productive! If I cannot sleep I’m usually stubborn and toss and turn hoping and praying I will fall back to sleep. If I give up then I’ll usually pick up a book or I might make coffee and blog read! I toss and turn and tell myself in my head to just go the heck back to bed…Sometimes it works! 😉 I would have to say my favorites are cake and muffins. I love the icing on cakes and crispy edges on muffins. Hope you can get a good night sleep tonight! Hotdiggitydog – applesauce and almond butter in ONE muffin – with not just any streusel topping but a “cinnamon sugar streusel topping”!!! AND they are flourless!!! Cannot wait to see photos of your trip and hear -read- about it! 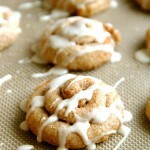 My hubby loves anything that is cinnamon apple, so these might just have to go down. Plus, these just look super yummy. Well done you – I would just normally watch netflix but yours sounds more productive. Love the sound of these just need to batch make me up some apple sauce and then I will be good to go! I live in South Africa and I am struggling to find applesauce. Do you think I could use apple baby food? Dude, when that happens to me I just stay in bed! But next time maybe I’ll make muffins, because baking at 3 AM actually sounds kind of fun. I’m totally with you on loving to bake muffins. I think they’re so much more fun than cookies, but whenever I ask people for requests, everyone always wants damn cookies. These look delish. Dense (and moist, haha) muffins are the best! Whenever I cannot sleep, I usually reach for my Kindle in hopes to just mindless read into a deep sleep. Otherwise, I toss and turn for about 5 minutes then get up to make coffee (always) and read blogs. Leh sigh. If I’m feeling REALLY chipper, I’ll go right into a workout or something. My favorite baked good is probably a fresh from the oven warm and gooey chocolate chips cookie with walnuts. I’m weird with nuts in desserts, but this one wins my heart. 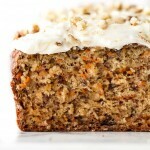 And carrot cake (weirdly) has been on the top of my list lately. Yum those look amazing plus I love apples and streusel topping…double win! Ha, ha…I often bake a kabocha and/or steam veggies in the middle of the night but usually keep trying to go back to bed then get up do something else and go back and forth…yep that’s my life! Since I get up at 4:30 to workout before school, I actually haven’t had trouble sleeping in a loooong time. I crash early and I crash hard! But I think in the past I’ve always just tried to wait it out and hope that sleep would come eventually. Muffins and cookies are my top 2! These look soooooo good. Haha I’ve definitely done some early morning baking at times when I couldn’t sleep too. It’s perfect because then you have something freshly baked just in time for breakfast! These look super delicious! And I just so happen to have leftover applesauce from a recipe I just made, so I can see these being made in the near future. I’m loving all of these flourless recipes you’re posting!! These look like the definition of ‘homely’ and ‘fall’ to me! So delicious! Where are the raisins in the recipe? Oops! Totally forgot to write them in — thanks for bringing it to my attention! I am sooooo craving something doughy and flourless now! I want to make all your muffin recipes when I get back home. When I can’t sleep, I just chill with my eyes closed for as long as it takes. My body can sometimes recharge a little if I just lay still and go into a more day-dreaming state. Pesky insomnia though. Hope you have a good night’s rest soon, girl! Sleepytime tea is my secret when I can’t sleep! Seriously I can’t keep my eyes open after I drink it. Honey Vanilla Camomile is my fav flavor. Quick question! Why do you only make 9 muffins? Do you just use 9 cups of a 12-cup pan or is a 9-cup pan standard in Canada…? I’m curious because I’ve only seen 6 and 12 cup pans in stores! Great recipe. You should probably go on vacation more often, because then when you come home and wake up early you can bake more treats. I love me some muffins! YUM! These look incredible! Can you feed them to me, please? Omg!! These look amazing. Going to try them this weekend. Thanks for sharing. Must try very soon!!! Thanks for the recipe!!! Can I substitute the apples for koalas? I like anything with a streusel topping. It elevates it to a whole ‘nother level, one which appeals to my taste buds and my tummy. Apples are actually a Fall flavor I can happily embrace, which might have something to do with the two bags currently resided on my counter. Yes, I am apple-fying all the things, which is a thing. Go with it. Never apologize for making moist muffins. It’s a baked good, it’s supposed to be moist and the rest of the moist haters will just have to get over it. Amanda, these look great! I sat and looked at apple cider at Trader Joe’s yesterday thinking I wanted to make apple muffins… but didn’t buy it. Also, I totally agree – I used to be all about the cookie, but now I LOVE muffins. I just pinned these, I can’t wait to try! Yum these look delicious! Muffins might just be my favorite type of baking and I am all about raisins in my muffins. I have to try these! How perfect!! I think I am having asthma issues from white flour and was looking for baking ideas without flour and came across your website on SITS girls!!! I am bookmarking your website and will be back. Thank you so much for posting these recipes. I have already peaked at the pumpkin and banana ones!! Yummy. 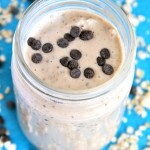 I will give these a try, especially since I already have all the ingredients in my cupboard!! 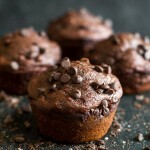 These muffins look delicious and shockingly healthy!!! Found you through the Saturday Night Fever link up! I can’t wait to look at everything else you have! These look great!! Thanks for linking up with SNF! Pinned to our party board! Oh wow! These look really great!!! 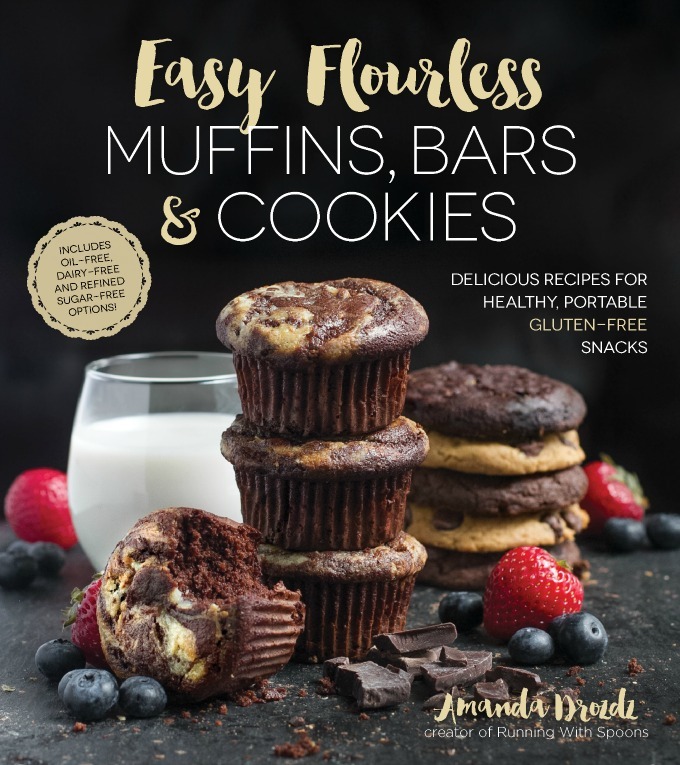 I need to try some flour free muffins one of these days 🙂 Thanks so much for linking with us at #FoodieFridays! Hope to see you again next week! Sometimes, you just have to go with it and wake up early; accept what happens! I had this happen when I couldn’t fall asleep before having to make it to a 6am shift (3 naps + coffee at 5 = not a good mix). But the day ended up not being so bad after I accepted it. Sometimes I wish it would happen on weekends now…just so I can maybe get all.the.things.done. 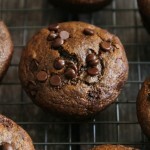 Flourless muffins for the win! I am totally digging this train you’ve been on so feel free to keep at it (moistness and all). I have a few apple stragglers on my counter begging to be used up and now I know just where to put them! These look delish! 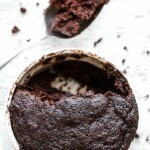 Im dying to know what kind of muffin tin you use – my muffins never look this good! 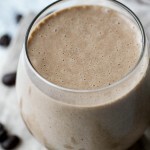 don’t have a blender… Would a food processor work? These sound amazing!!! Hi Kaytlynn! A food processor should be fine. All you really need to be able to do is break the oats down so that they’re almost a flour consistency, and then mix everything together. Can we use apples instead of applesauce? If so, how much do you think? Unfortunately not, Chloe! The applesauce is needed to add moisture to the muffins, so apples wouldn’t work. These were very good! My picky toddler gobbled them up, too. I didn’t have quick oats for the topping so I just pulsed a handful of rolled oats in my food processor for a few seconds to break them up. Worked great. Thanks again for the yummy recipe. Do you know what the calorie count is per muffin? They are wonderful!! These muffins are so good! My husband and all 3 of my girls including my one year old love them!! would you happen to have the nutritional value on them? Thank you for these wonderful recipes. I’m one of the coaches for 90/10 nutrition and we are ALWAYS looking for clean recipes to share with our followers. Thank you for providing that! This is a great recipe, and right in alignment with our program! 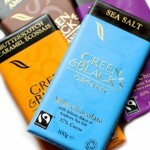 These look amazing, I’m really looking foward to trying them! Can I skip the streusel topping though? ^-^ I’m sure the muffins would taste great without it but what do you think? You can definitely skip the streusel if you want, Sam! The muffins are fine on their own. The substitutions are definitely the reason that the muffins didn’t work out, Julianne. The oats are what help make the muffins fluffy, and the almond butter is what gives them shape and bulk. Regular oil is too oily and would cause the muffins to fall apart. do you think these would work as mini muffins?? they look delicious. thanks! It’d definitely work, Heather! I’d start checking them around 10 mins. If I omit the raisins and don’t replace them with anything, do you think that would affect any other aspect of the recipe? A new breakfast staple in our house…no one even knows they’re GF! Great recipe – easy and feel-good food. I subbed shredded apple for applesauce and peanut butter for the almond butter. I forgot the streusel but they were still wonderful.